After productive spring training warm-ups, the Phillies will open the season on Monday afternoon against the Cincinnati Reds with the right roster mix to pursue better results than in 2015, as one former Phil sees it. The Phils really struggled last season, finishing dead last in the wins column among the 30 teams in the National and American leagues with a dismal 63-99 record. The team is going through a rebuilding process in a very tough National League East Division that includes the New York Mets who played in the World Series last season, along with the Washington Nationals, the Miami Marlins and the Atlanta Braves. Doug Glanville, who played for the Phillies from 1998 to 2002 and later in 2004, offered his views on returning the Phils to their glory years of 2008, 2009 and 2010, when they were one of the best teams in the majors. “They’ve made a lot of moves to slowly move that wave that brought the championship to Philly like Jimmy [Rollins] and Chase [Utley] to move on and now they’re getting prospects and building from within too,” said Glanville, now an analyst on ESPN’s Wednesday Night Baseball. Glanville says the Phillies have two up-and-coming prospects with righthanded pitcher Aaron Nola and shortstop J.P. Crawford. Nola, 22, could be one of the Phillies top pitchers this season. He posted a 6-2 record with 3.59 ERA and had 68 strikeouts. Crawford, 21, will start the season in Double A at Reading. He was the Phillies first-round draft pick in 2013. A year ago, he batted .265 with five home runs and 34 RBIs. 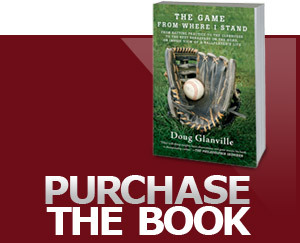 “I covered Aaron Nola at the LSU tournament against Stony Brook,” Glanville said. “As a freshman, this kid had ice water in his veins. He was unbelievably calm. That poise, control and pinpoint accuracy he walked less than 10 hitters that whole season. This is the future that’s not that far away. “The kid [Crawford] has phenomenal skills and talent. He will be there. It’s more of a when thing. Young guys are contributing now as fixtures. They’re not just coming up being window dressing. They’re coming up and having impacts and they’re given the latitude to do it. I think Crawford can be that player,” said the outfielder and University of Pennsylvania product, who spent nine years in the major league. There has been a lot of talk about first baseman Ryan Howard’s role with the team. Howard, 36, is at the end of his five-year, $125 million contract. The former National League MVP, who was on the 2008 World Series champion team, still has some power at the plate, hitting .229 with 23 home runs and 77 RBIs over 129 games in 2015. Third baseman Maikel Franco looks like a rising star for the Phillies. Franco hit .269 with 21 home runs and 82 RBIs. The Phillies will start the season with a three-game series against the Reds in Cincinnati. Then, they visit the New York Mets for three games before returning to Philadelphia. The team plays its home opener at 3:05 p.m. April 11 against the San Diego Padres at Citizens Bank Park. Republished from The Philadelphia Tribune.